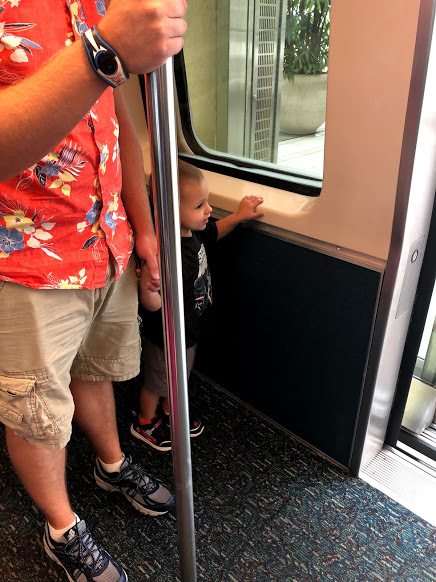 Yes we went on a Disney vacation again. This time with both kids. 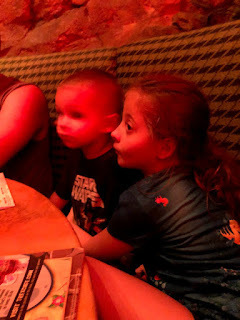 This was Aubriella's second time and Austin's first time. 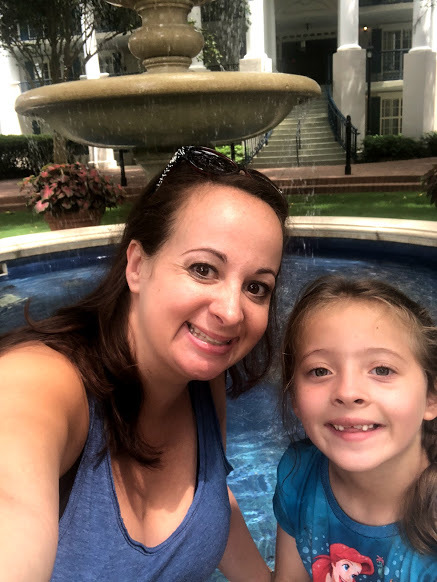 We went the last week in August. Yes we are crazy because it was super hot, and rained everyday. But it worked for us since Aubriella didn't start school until after Labor Day this year. This was the most fun, most relaxed, and most stressful trip. We dropped off our checked luggage and headed for security. Austin and Aubriella did so good with being up extra early and standing in line. Now the fun began. Austin's little book bag and my carry on got extra screened. The diaper wipes that were unopened set off alerts for potential dangerous chemicals. They had to give me a tap down and get approval for us to go through security. This took an extra half an hour. We finally made it through security and found some breakfast. 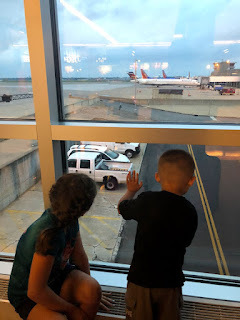 Austin and Ella found some airplanes to watch. 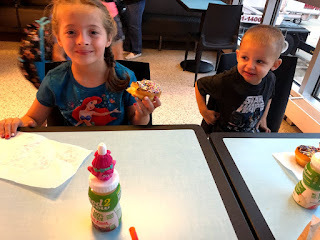 Breakfast from Dunkin Donuts is always a great start. We are on our plane and ready to go. We fly Southwest. Families get to board after group a. 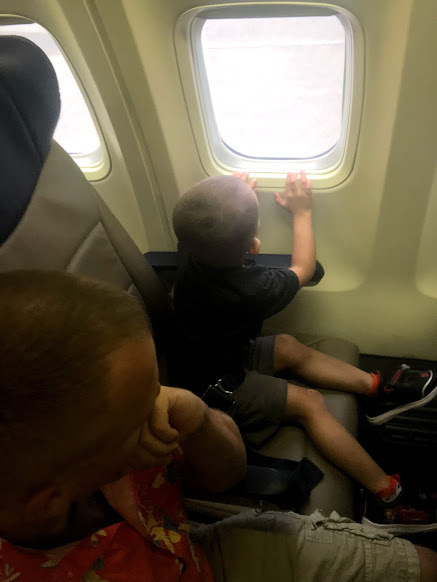 Their planes only side 3 and 3 across so we opted for Brian and Austin to sit together and Aubriella and me to sit together. 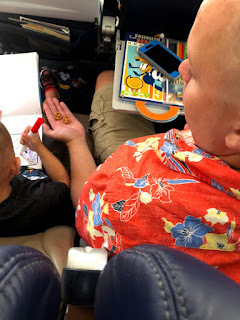 We came prepared with snacks, coloring, kindles, drinks, and candy to keep them both amused. They both did very well. They both ended up falling asleep on the first flight. 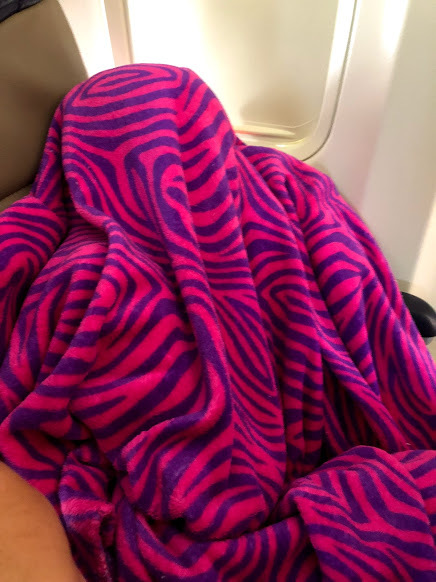 We had a short uneventful layover in Atlanta. It was crazy to watch another plane land at the same time as we were. 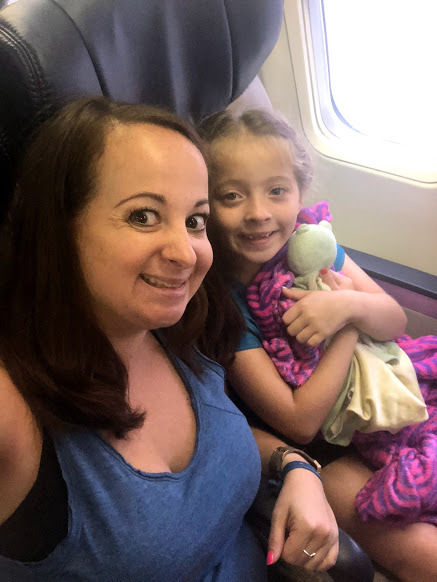 We made it to Orlando International Airport. It is so huge you have to take a tram from one section to another. 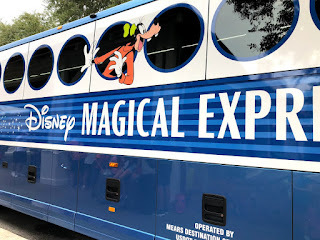 Since we were staying on Disney property and taking the Magical Express to the hotel, Disney takes your luggage to your resort and it magically appears in your room a few hours later. 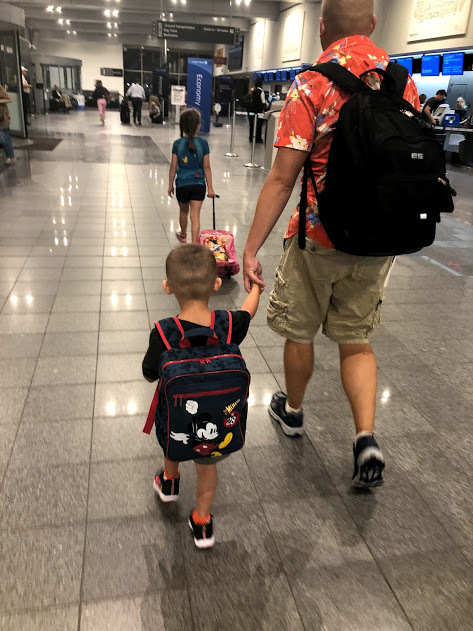 Brian had a gut feeling that one of our suitcases Disney luggage tags had fallen off so we went to baggage claim. (bad start number 2) My suitcase was there. We ended up taking it with us. We later found out that any luggage that is left at baggage claim Disney will check and see if you are staying on their property and bring it you, it just may take a little longer. Boarded on the magical express. Someone is excited. Our bus was brand new and in the testing phase. It was great with flat screen tv's and between each seat was usb charging ports, which worked out great because my phone was almost dead. We arrived at Port Orleans Riverside at 2pm. Check in wasn't until 3pm. (bad part number 3). Our room wasn't ready until after 430. There was never an apology, I'm sorry, or nothing. Very disappointing. We found a bench and a little patch of grass for the kids to run around. Then a storm rolled in. We went and ended up getting something to eat just so we could stay dry. Thankfully by the time we were done eating our room was finally ready. We had a Royal Room. 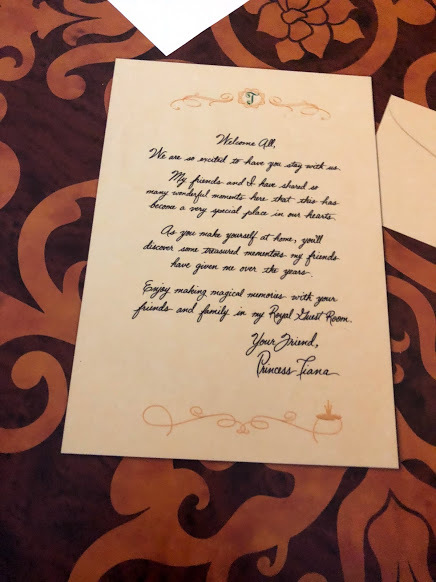 There is a note from Tiana welcoming you. 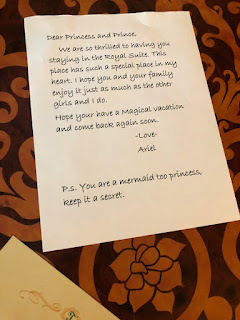 I brought an extra special note from Ariel which is Aubriella's favorite. We rented a double Bob stroller from Kingdom strollers. It is so worth the investment. Not hearing the kids fight or whine about walking, not worrying about Austin wondering off, and getting where we are going in a timely manner, and so many other benefits. Cons of this stroller, hard to fold up, doesn't fold very flat. You have to fold it to get on every bus and stand with it. Brian was standing with it trying to balance it on the front wheel numerous times a day. 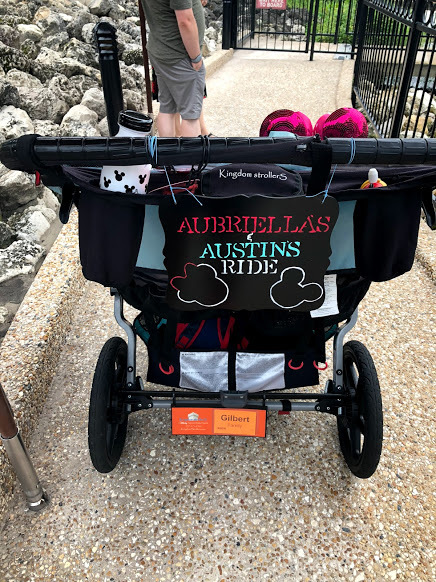 I had made a personalized stroller sign to hang on the stroller to hang on the stroller to make it easier to find. 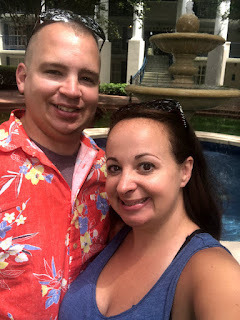 After enjoying our room and resort a little we took a boat over to Disney Springs. 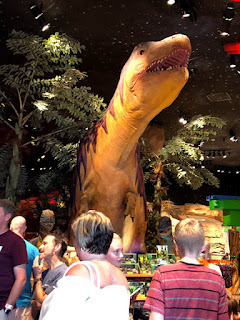 First stop was dinner at T- Rex. The food was ehh but the atmosphere with the moving dinosaurs and decorations made it all worth it. Austin is on a dinosaur kick right now and loved it. 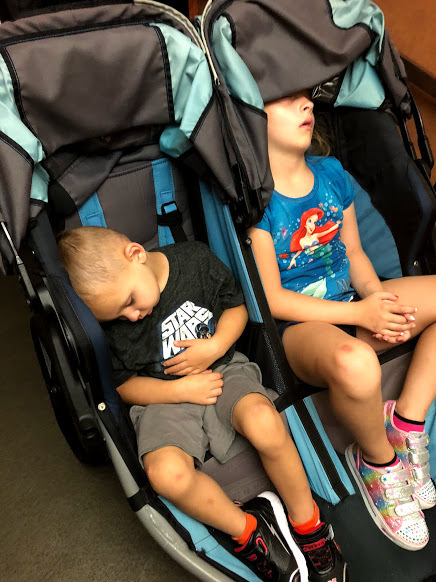 We walked around Disney Springs a little and both kids fell asleep. 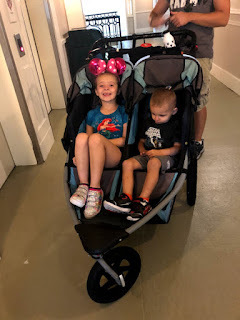 It really made having the stroller that much easier on us than carrying two kids and a diaper bag. 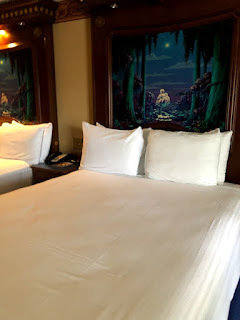 Our favorite part of the Royal Room was the fireworks above the bed. They only lasted about 30 seconds then turned off but was still amazing. Our first day started off pretty rough but ended on a good note. We were gone for 8 days. Stay tuned in the next few weeks for all the details from our vacation.